Working together to save lives... One Yorkie at a time. Your help is desperately needed! Won't you please give us a hand with our latest rescued Yorkies? 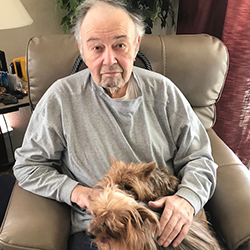 Bob Stewart and his wife Cynthia gave their hearts and souls to Yorkies. Cynthia is a fostering member and her husband Bob helped her in this role. Fostering and rescuing yorkies was their passion. Bob would love to know that he’s helping save more yorkies even though he’s no longer with us to do so. Donations in lieu of flowers can be made in Bob's name using the following PayPal button! Please include "For Bob Stewart" in the notes section of Paypal. Or, you may send a check to our treasurer at P.O. Box 23, Wales, WI 53183. We are an approved 501(c)(3) organization. All donations are tax-deductible. 2019 is in full swing here at United Yorkie Rescue. Our most recent news to share is our involvement in helping to rescue dogs from a huge Georgia puppy mill. UYR was contacted by rescuers on location in southern Georgia and our volunteers across several states immediately began organizing and formulating a plan to take as many dogs as possible. These dogs suffered horrific neglect and have been welcomed with open arms into our UYR foster homes. The puppy mill had over 700 dogs in it. The story was carried on many news stations and newspapers and is one of the largest puppy mill cases ever recorded. 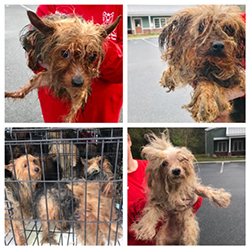 All of the animals involved, including the twenty dogs taken in by United Yorkie Rescue are now safe and receiving the care they have lacked. These dogs have been living in crates their entire lives. They were discovered housed in a warehouse with 700 other dogs in crates stacked floor to ceiling, often 4 dogs to a crate. All the dogs taken in by UYR were matted to the skin, covered in urine and feces, have severe dental disease and have never been held or socialized. The UYR rescue effort involved many UYR volunteers, partner groups, friends of rescue and transporters all working together on the road and from their phones and computers to locate and secure the necessary human and other resources to pull this effort off. Foster homes, transportation, lodging for transporters, etc. were all in place within hours. After a massive 72-hour effort, we can say that all dogs taken by UYR have made it from puppy mill to loving foster home and are now receiving the medical care, grooming, and more importantly the love they have lacked. We will be featuring them on our social media pages so that everyone can follow their transformations which are already nothing short of miraculous! It was an exhausting, humbling and extraordinarily emotional experience for all involved but all dogs from this house of horrors are now safe. This was a large undertaking for us and we will need major support from our UYR family of supporters to accomplish all that the dogs need. Please consider helping in the fight with a donation. Thank You! And check out our news coverage in Nashville, TN. 2018 was another busy year for United Yorkie Rescue. We rescued 244 dogs, had 224 adoptions and spent more than $219,000 in vet expenses. We have to thank our wonderful donors and members for our success because without their support, all this would not be possible. Thank you one and all! United Yorkie Rescue is pleased to share that a wonderful organization, Wrapped in Love (WIL), will be featuring us on the WIL Facebook page and website on Sunday, May 21, 2017 and will be providing UYR with adoption blankets, belly bands, diapers, bandanas, and tug toys. Wrapped in Love is a group of artisans who recognize that everyone can do something in the rescue world and this is "their something". Each item is carefully handcrafted with Love and sent directly from the WIL members' homes to the featured rescue(s). If you would like to learn more and join this amazing and supportive group, visit their Facebook page at www.facebook.com/groups/artisanswithamission and the website, where all the pledging is done, at www.wil4u.com. In under 3 years Wrapped in Love has pledged over 11,000 blankets plus thousands of other items. This mission will continue until all rescue and shelter dogs find loving forever homes! UYR is proud to have been selected as a recipient of their support. ********** Can you imagine forcing your pet dog to live his or her entire life in a small wire cage with no human companionship, toys, or comfort, and little hope of ever becoming part of a family? That is what life is like for a puppy mill breeding dog. Help us stop this cycle of cruelty that contributes to pet overpopulation and the suffering of countless dogs by adopting your next pet. There are many places you can adopt your next pet, such as an animal shelter, humane society, or a rescue organization. Click on our Looking for Love link and check out all the beautiful Yorkies in our foster program. If you don't see what you are looking for, we recommend visiting www.petfinder.com. You might be surprised to see all the pets available in your area. Remember: Adopt, Don't Shop! Check out our adoptable pups on Looking for Love to find your perfect companion. If you are interested in adopting a dog not located in your state, please note that we do not ship dogs via air cargo. Out of state transport guidelines are explained on our online adoption request form. UYR is in need of foster homes. We have many more requests for surrender than we can handle. If you would like to become a UYR foster person, please, fill out a "Volunteer Application." UYR could not continue to rescue Yorkies in need without the help of our donors. To date we have rescued: 2,905 Yorkies and Yorkie mixes. Our vetting costs to date are: $1,632,000!! Any donation amount is truly needed and appreciated. UYR fully vets all its foster dogs, updating vaccinations, spaying and neutering, addressing much needed dentals which cause serious health issues down the road for any dog. We are also one of the few rescue groups that can take on serious conditions like Liver Shunt, orthopedic injuries and tumor surgery. Won't you please consider joining the list of donors on our page to help us continue to save our beloved breed? Photo submissions are being accepted April 1st through June 1st for the 2017 Calendar. Email as many photos as you'd like of dogs that were adopted from rescue groups or shelters to fortheloveofrescues@yahoo.com. 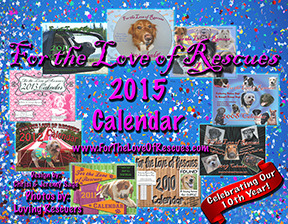 Those selected get a calendar at cost ($5) plus shipping. All natural pet snacks No Steroids, hormones or antibiotics. Use Coupon Code UYR5OFF in the shopping cart for a 5% discount. UYR receives 10% of the sales. Looking for a pet friendly apartment? Here's a helpful site. Click here to visit the Yorkie Shoppe. All funds support our vetting and rehabilitation mission. Spring is in the air and Summer is around the corner. Visit the Yorkie Shoppe for great walking harnesses, dresses and hair accessories. All proceeds support our fosters' vetting needs. If you need to surrender your Yorkie or mix, please, use this link "Request To Surrender Form" to contact to contact a UYR representative. Please complete this form in its entirety, including a photo if possible. A representative will be in contact with you as soon as possible to make arrangements or refer you to another rescue if we do not have members in your area. Read about Ozzie, our first liver shunt pup, on the Yorkie Tales page. See a happy ending to a serious medical condition. Your donation can make a BIG difference. Look us up on GuideStar, a national clearinghouse for non-profits. As of December 30, 2017, UYR has 16 Yorkies in the Forever Ours Program. These pups will remain with UYR for the rest of their lives. They receive vetting care as needed and this care is provided by UYR and your donations. We are always looking for people who would be interested in being a 'Sponsor' to one or more of our Forever Ours Yorkies! As a sponsor you will become a cherished person in this dog's life. You would receive communications about your sponsored pup and your name would appear in their story on the Forever Ours page. Please, visit our Forever Ours page!!! We have had many requests for a way to make a donation to UYR in lieu of gifts for family and friends on birthdays and other special occasions. We listened and have designed a special card that we'll send to your loved one. Please, be sure to include to whom and what you're designating the donation. To make this thoughtful gift, contact: treasurer@uyr.us. We appreciate the overwhelming generosity of our donors! The members and Yorkies of UYR say THANK YOU!! !